When you think of college posters of New York City, you probably think of the New York City Skyline. It's a pretty popular choice for dorm wall art and it's a gorgeous view. However, maybe you want something a little different for your college wall decor but still want a dorm room poster of New York City. You feel at a loss for what to get because the skyline is a pretty popular dorm wall art item. 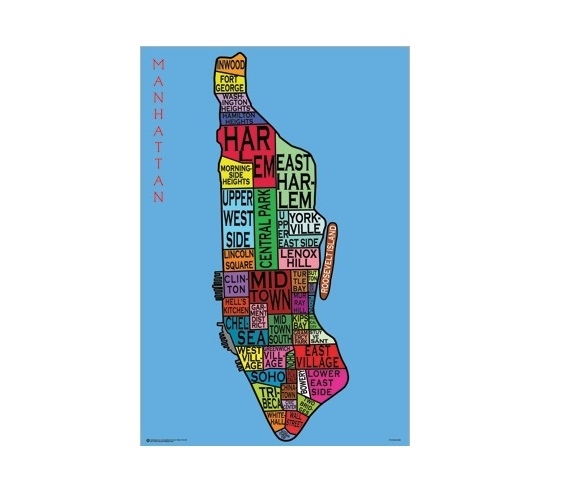 However, with our Manhattan Neighborhoods Poster for Dorm Rooms, you can have the college poster of New York City that you want and also have the unique college wall decor piece that you're looking for in your dorm essentials! This must have dorm item has a pretty cool design that will add plenty of color to your dorm room decor! This dorm necessities item features a map of Manhattan with the neighborhoods labelled. Each neighborhood is labelled in various colors that creates a unique look. Surrounding the map of Manhattan is bright aqua from the water surrounding it. This dorm necessities item will add plenty of cool, edgy design elements to your college wall decor and make your college dorm room a fun place that your friends will love to hang out in!